Canon has unveiled two new compact camera models to slot into its line-up of IXUS cameras, the Canon IXUS 500 HS and Canon IXUS 125 HS. The IXUS 500HS features a 12x optical zoom in a slim, 19.2mm body, making it the slimmest camera of its type in the world. The IXUS 125 meanwhile features a 5x optical zoom. Both of the new models feature Canon's HS system, combining a 10.1-million pixel sensor on the 500HS and a 16.1-million pixel sensor on the 125 HD with the latest Digic 5 fast image processor, which is only available on a handful of current Canon cameras. ZoomPlus technology is also included, extended the cameras' zoom range beyond the maximum focal length of the lens. The IXUS 500 HS can reach up to 21x magnification, while the 125HS can zoom up to 10x. Both models feature a 3.5 stop optical Image Stabiliser to help capture low-light images and Full HD video footage. Meanwhile, Intelligent IS technology is also included to automatically analyse the subject to apply the most appropriate Image Stabiliser settings from seven different modes. Smart Auto mode has been enhanced to detect 58 different types of scene, applying the combination of camera settings for the best picture possible. Face ID also works with Smart Auto. Face ID has the ability to recognise a person's age to apply the most appropriate settings to capture a great shot. For example, if it spots a sleeping baby it will disable flash and any camera sounds, while if it spots two children playing in bright sunlight, it will anticipate movement and engage continuous shooting and Servo AF. Both cameras have the ability to shoot full HD video at 1080p while using the optical zoom. The IXUS 500 HS also records sound in stereo, and the camera also has an integrated HDMI-CEC port. Movie Digest mode allows clips and images from one day to be combined into a movie bonus reel. Fun effects, such as Miniature, Fish Eye and Soft Focus are also available, along with Smooth Skin for evening out skin texture. The Canon IXUS 500 HS UK price will be around £309 and will be available from early March. 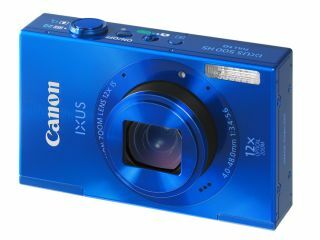 The Canon IXUS 125 HS UK price is around £229, and it will be available from late February.